Looks like the priority date would then be April 26, 1935. Köln (Cologne) is the fourth largest city in Germany is one of three place we find him associated. Also, Bensheim, Germany. And also: Allemagne (and there might be a confusion of options for that place name). We do not yet have a timeline of his movements or education or work. GB489139 Improvements in or relating to wind- driven power apparatus Our PDF copy. The two patents seem to be of the same content, but not sure until a good English translation is had of the DE656194. Both feature the same drawing, but the text might hold differences. Rough draft historical research on Aloys Van Gries. Summary note: The technical statics book on aircraft at the 1920 state of understanding in German at 398 pages gives some clue to the technical power of Aloys van Gries. There are robust analyses of biplane aircraft structures; if one wanted to steep in biplane aircraft, then this book might be important for that. Near 18 MB file. In AWE, I am seeking a "feel" for what brought him to the 1935 patent on airborne wind energy, about 15 years following his publishing the major textbook on aircraft statics. 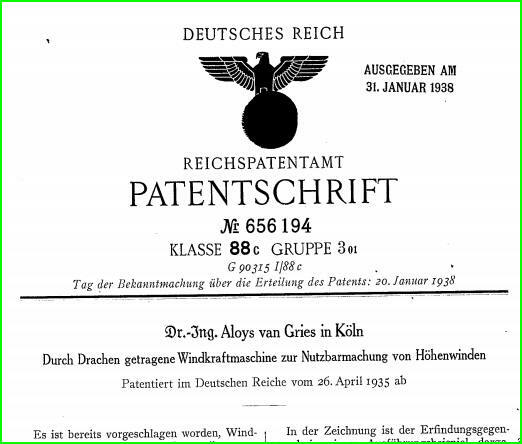 The book might give some clue to Aloys van Gries' mind that brought about his later filing the patent on the AWES scheme. Apparently he had some interest in the study of warts. Aloys Van Gries-Str., Bensheim, Germany Is there a street named after him? Yes. So, the territory thought well enough of him to name a street after him. I do not have any information about the street's naming. Google Maps satellite show a short segment street with about seven houses on it. Bürgermeister: 1871–1902: Aloys van Gries. That is a long term of being mayor! I am wondering if this is our guy or not??? I wonder if Museum der Stadt Bensheim (municipal museum) has anything about these matters. "When the Municipal Order of the Grand Duchy of Hesse came into force on 30 June 1821, Bensheim citizens were allowed to choose their mayor." Éolien [FR] Moteur FR000000825476A This patent holds the same mechanical content as the UK patent, but the language is French. https://depatisnet.dpma.de/DepatisNet/depatisnet?action=pdf&docid=FR000000825476A Another residence.